Meet the new ACID Pro 8. Introducing the all-new ACID Pro 8. This is the latest version of the software that launched loop-based music production over 20 years ago and is packed full of contemporary and pro-level features for today's creative artists and producers. Powerful 64-bit technology sits behind a sleek, new interface that maintains ACID Pro's famed easy workflow. Dozens of new instruments, loops and effects line up with 12 GB of brand new content to give you everything you need to create music in any genre. With VST3 support coming soon in a free update, ACID Pro is future proof and ready to embrace a new world of plug-ins. ACID Pro 8 is the legendary software reborn for 21st century audio production: With more features, more power and more plug-ins – all with the same easy-to-use workflow. The all-new ACID Pro 8. 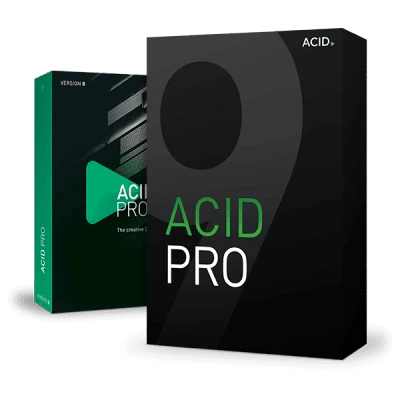 ACID Pro 8 boasts a brand new interface reflecting its status as a modern, sleek and creative DAW that appeals to all levels of music producers. Existing ACID users will feel right at home with its familiar workflow while enjoying a slick, new environment designed for more precise mixing, creative composing and professional recording. More power under the hood. New technologies in ACID Pro 8. Give your music production a boost with a DAW designed to take full advantage of your computer's resources. ACID Pro 8's new 64-bit architecture works with your PC, utilizing its full power so that it can handle even the most demanding projects. Your creativity now has no limits. Run real-time effects, unlimited audio tracks, hundreds of loops and instruments within huge projects, all latency free. A powerful arsenal for your ideas. New to ACID Pro 8 is essentialFX Suite which has all the effects you need for creative music production. It includes 11 first-class plug-ins for all stages of the music making process, including a compressor, gate, reverb and delay. Liven up or smooth out your musical tracks with AM|TRACK SE, an ultra-realistic analog modelling compressor which features a Vintage Mode, ideal for adding attitude when you need it. A powerful guitar and bass effects rack that models stomp boxes, guitar amps and speakers. It's a complete guitar effect signal chain, in software. ACID Pro 8 boasts an incredible new range of plug-in instruments. These include a performance sampler, analog synth and 13 amazing Vita Solo instruments that produce everything from rock drums to an ultra-realistic grand piano. This is a fantastic beat-making tool and is ideal for many current genres of music. Play everything from huge trap beats to furious metal! An incredible, sampled concert grand piano which offers all the power and detail of an amazing instrument recorded in its natural environment. This instrument stylishly recreates the emotional and dramatic sounds of an original organ and is suited to both classical and contemporary music. This drum instrument is perfect for dubstep and hip-hop grooves, and programming it is easy as it's based on easy-to-use hardware beat makers. Create a variety of vintage tones with all the organic character of the original instrument. Ideal for smokey jazz, melodic blues or funky riffs. The perfect instrument for providing more dynamic beats to your music – everything from grooves with a huge arena sound to clean studio drums. Drum Engine includes a range of preset sounds – from modern pop kits to groove box samples – so you can create beats over a wide variety of styles. Create the complete sound of a choir including classic choral arrangements, male voices, crystal-clear female vocals and mixed-voice choirs. Take your sonics out of this world and produce everything from dreamy sequences to heavy basslines and atmospheres to soundtrack any film. Emulate the sounds of legendary hardware synthesizers! With its retro design and hands-on controls you'll be creating vintage tones in no time. Take a trip back in time with an instrument that is focussed completely on vintage organ sounds, with plenty of hands-on controls to shape the sounds. Perfect for laid-back funk riffs, soul ballads or more current genres. It is elegantly-designed with a multitude of options for sound design. Everything from the driving pulse of a classic jazz tune to a more abstract groove for an electronic-based track, and also great for more laid-back beats. A sample player based on the Independence ROMpler. It reproduces a variety of real instruments with an on-board filter and effects for sonic customization. A fantastic sampler that slices up any audio file and automatically assigns the samples to pads so that you can create new grooves and melodies. A powerful but easy-to-use virtual analog synth which is capable of creating everything from classic vintage sounds to modern EDM soundscapes. Enjoy all the new additional features in ACID Pro for a low monthly cost and get exclusive content too! 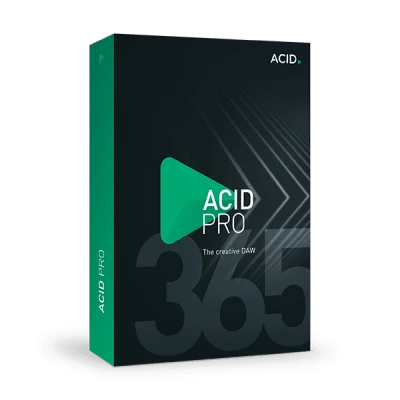 ACID Pro 365 keeps you up to date with the ACID Pro universe with all the updates, new features, new instruments and effects as soon as they are released – starting at just $7.99 a month. 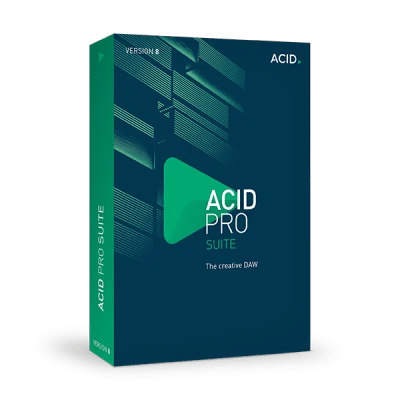 ACID Pro 365 also includes exclusive instruments like Vita Pop Brass and Orchestral Ensemble and effects like Analogue Modelling Suite to help you stay ahead of the game. Your future is secure with ACID Pro 365! Vita Pop Brass Pop Brass will find a home in all genres of music: Smooth funk, orchestral arrangements, tight Latino rhythms and modern R&B. It is the ideal instrument for both elaborate productions and creative jam sessions. An instrument that focuses on the ensembles within a symphonic orchestra. It sounds incredibly authentic but is also very easy to use and ideal for everything from dramatic brass staccatos to gentle string legato. Another exclusive addition for ACID Pro 365 users is Analogue Modelling Suite. It has four classic plug-in effects: the AM|MUNITION compressor/limiter, the AM|PULSE transient modeler, AM|PHIBIA tube amplifier/channel strip and the AM|TRACK compressor/tape simulator. 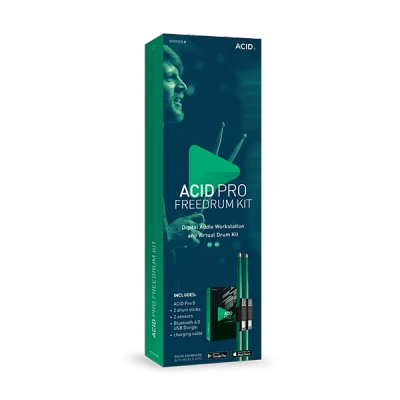 ACID Pro 8 Suite is the ultimate collection of plug-ins for music making and provides producers with an incredible $2,000 worth of instruments, loops and effects to make complete songs in any genre. 10 new Vita Solo Instruments. With the Analogue Modelling Suite, Vintage Effects Suite, VariVerb II and Vandal, music producers have a huge arsenal of effect plug-ins at their disposal, offering unmistakeable vintage character for pro quality results. All your analog recording needs are tailored for with Analogue Modelling Suite. It contains four excellent plug-ins – the AM|MUNITION compressor, AM|PULSE transient designer, AM|TRACK tape simulator and AM|PHIBIA tube amp – offering pristine mastering effects, and an analog experience that no studio should be without. This suite includes three incredible VST plug-ins: Corvex, Ecox and Filtox. These authentically recreate the classic sound of analog devices, offering realistic tape echo sounds, plus precise modulation, chorus and flanger effects for the perfect vintage vibe. The VariVerb II plug-in contains evocative preset and custom reverbs that will add atmosphere to your mixes and give drums, guitars and vocals a brilliant depth and enhanced character. Vandal is a virtual bass and guitar amplifier and a whole lot more besides. It offers guitarists and bassists the complete signal chain and authentic recreations of real amps, from their tubes to speaker coils. Producer Planet is a brand new platform for all producers. There are ACID loops and samples, virtual instruments and other audio and video products, all designed to enhance your music making experience. It's also the ideal resource for any professional producer to access the tools they need for whatever production they are working on.